Dr. Dean Kiesling has obtained an Ohio State basketball and traveled to Columbus to the Ohio State basketball office on Monday to obtain the autograph of first-year Ohio State men’s basketball coach Chris Holtmann. Dr. Kiesling donated a golf ball autographed by PGA professional golfer Ricky Fowler along with a Muirfield golf course map autographed by Phil Mikkleson. Three additional auction items have been donated to the Hillsboro Rotary Club’s 46th Annual Ernie Blankenship Memorial Radio-Telethon to be held Wednesday, March 28th, at NCB Bank. The items will be auctioned and the proceeds donated to the radio-telethon for the benefit of the Highland County Society for Children and Adults. 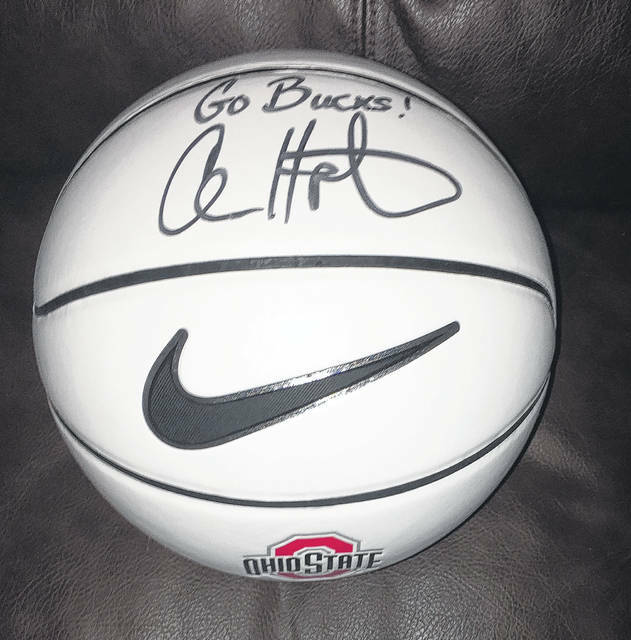 Local optometrist Dr. Dean Kiesling has obtained an Ohio State basketball and traveled to Columbus to the Ohio State basketball office on Monday to obtain the autograph of first-year Ohio State men’s basketball coach Chris Holtmann. “Given the great success in his first year as head coach of the Buckeyes expectations for future teams is high and this could become a great collector’s item,” Rocky Coss, Rotary chair of the event, said in a press release. Dr. Kiesling has also donated a golf ball autographed by PGA professional golfer Ricky Fowler along with a Muirfield golf course map autographed by Phil Mikkleson, whose autograph is a highly sought item by collectors, according to the press release. The two have been mounted on a wooden base for display. John Barney and WSRW Radio have donated eight tickets to the Cincinnati Reds v. Chicago Clubs baseball game on Friday, May 18th. The tickets are in Section 110. The Hillsboro Rotary Club will be taking bids on the items until 8:45 p.m. on the night of the radio-telethon. Bids can be made in person at NCB Bank, or can be called in during the radio-telethon between 6 p.m. and 8:45 p.m. by calling 937-393-4246. Bids can also be placed in advance by calling a Rotarian or by calling 937-393-2142 and placing your maximum bid. It will be confidential and will constitute your maximum bid. Lower bids will be placed against that maximum until the item is sold or the maximum is exceeded. https://www.timesgazette.com/wp-content/uploads/sites/33/2018/03/web1_auction-tel-2018-basketball.jpgDr. Dean Kiesling has obtained an Ohio State basketball and traveled to Columbus to the Ohio State basketball office on Monday to obtain the autograph of first-year Ohio State men’s basketball coach Chris Holtmann. https://www.timesgazette.com/wp-content/uploads/sites/33/2018/03/web1_auction-tel-2018-golf.jpgDr. 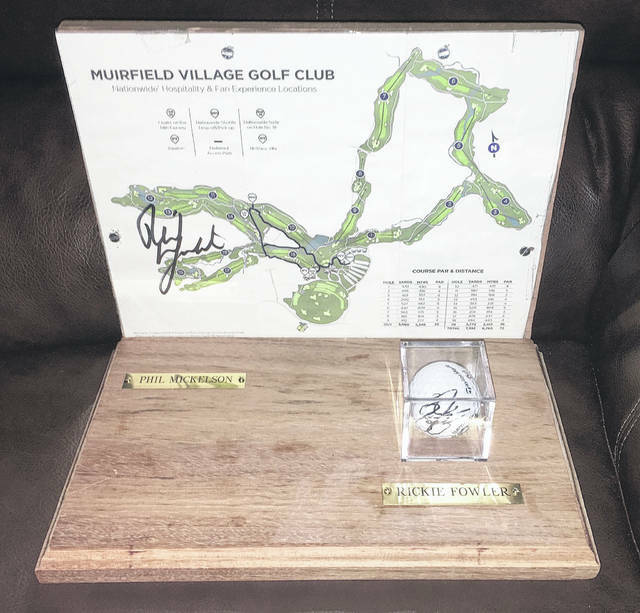 Kiesling donated a golf ball autographed by PGA professional golfer Ricky Fowler along with a Muirfield golf course map autographed by Phil Mikkleson.